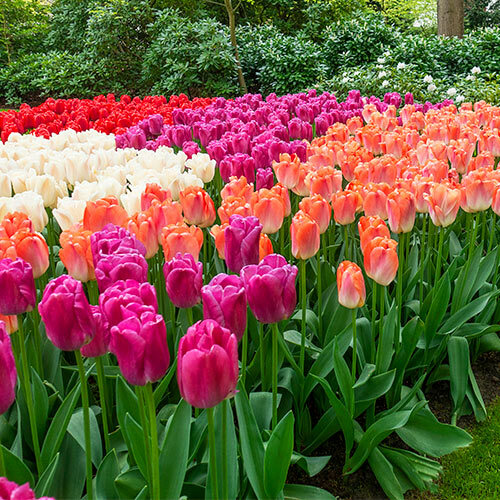 A vibrant mix of pink, red, purple, apricot and orange Pride Tulips. These long-stemmed perennial tulips are some of the best for landscaping—and sure to become a favorite for borders! Sports of Darwin Hybrid Tulip Ollioules, Pride Tulips have huge, bell-shaped, 5" flowers that burst into bloom in mid to late spring. Their sturdy, 22" stems hold up well in the landscape and cut-flower arrangements. Pride Tulips perennialize well when planted in well-drained garden beds—so you'll be rewarded with gorgeous displays year after year. Let foliage yellow before you remove it. This way these tulips will bloom year after year. Best to fertilize in early and/or mid spring. This will certainly help the bulb to build energy for next year.